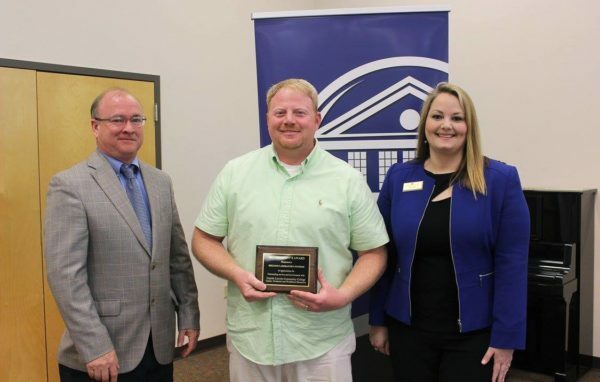 Co-Lin Career, Technical and Workforce Education Division recognized Sheldon Laboratory Systems for their service and partnership at the Business and Industry Appreciation Breakfast. The annual appreciation event is an opportunity to honor district businesses or organizations that have provided exceptional support for Co-Lin students and programs. Justin Slawson, Engineering Manager (center) accepts the President’s Award for Sheldon Laboratory Systems. Presenting the award were Dr. Ronnie Nettles, President (left) and Jackie Martin, Dean of Career, Technical and Workforce Education.